Palutena from Kid Icarus & Super Smash Bros.
“Talented” and “prolific” make a great combination in a LEGO builder, and like many of the builders we feature here on The Brothers Brick, Finnish builder Eero Okkonen manages both. 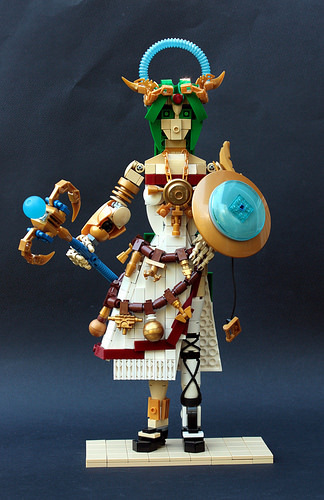 Following his fantastic LEGO characters from Nausicaä, Eero has tackled Palutena, Goddess of Light, from the Kid Icarus series of Nintendo games (also featured in Super Smash Bros.). Never shy of color, Eero incorporates numerous pearl-gold and light-blue trans-clear elements. Read more about the build on Eero’s blog, Cyclopic Bricks.